If you're on a road trip to Washington, D.C. or have rented a car at the airport, you are likely wondering about how to drive on what locals call the Capital Beltway. It's actually Interstate 495, a 64-mile highway that encircles Washington. The highway passes through Prince George's and Montgomery counties in Maryland, and Fairfax County and the city of Alexandria in Virginia. So I-495 is the Capital Beltway, or just "The Beltway." The two directions of travel, clockwise and counterclockwise, have become known respectively as the "Inner Loop" and the "Outer Loop." Knowing the terminology is the start of knowing how to navigate this circular road. Access to Washington, D.C. is via I-270 and I-95 from the north; I-95 and I-295 from the south; I-66 from the west; and U.S. Highway 50 from both the west and the east. The most scenic routes from I-495 into Washington are via the George Washington Memorial Parkway along the Virginia side of the Potomac River, the Clara Barton Parkway along the Maryland side of the river, and the Baltimore-Washington Parkway, approaching downtown from the northeast. Construction of the Capital Beltway began in 1955 as part of the Interstate Highway System that was created in the Federal-Aid Highway Act of 1956. The first section of the highway opened in 1961, and the highway was completed in 1964. Originally, I-95 was planned to serve downtown Washington from the south and north, intersecting the Beltway in Virginia and Maryland. However, the plan was canceled in 1977, and the completed portion of I-95 inside the Beltway from the south running north into downtown Washington, D.C.
By 1990, the eastern side of the Beltway was dual-signed I-95/I-495. Exits were renumbered based on mileage from I-95's entry into Maryland at the Woodrow Wilson Bridge. Understandably, this was confusing. The explosive growth of housing and businesses in the Maryland and Virginia suburbs has created heavy traffic around the region, especially on the Capital Beltway. Despite numerous widening projects over the past few decades, heavy traffic is a continuing problem. 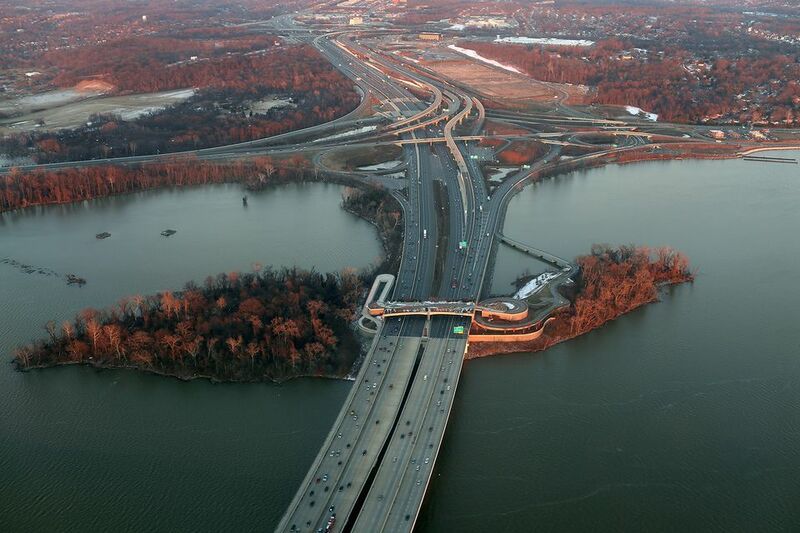 Intersections on the Capital Beltway that are ranked as the "worst bottlenecks in the nation" are the interchange at I-495 and I-270 in Montgomery County, Maryland; the interchange at I-495 and I-95 in Prince George's County, Maryland; and the Springfield interchange, where I-395, I-95, and I-495 meet. Driving on the Capital Beltway and other Washington, D.C. area interstates can be a headache. You can lessen the chances of having problems by keeping informed and planning ahead. Plan your route in advance and give yourself plenty of time to move to the right-hand lane when exiting. In heavy traffic, it can be difficult to switch lanes and might require more time than you would expect. Traffic can be unpredictable. Be flexible and ready to use an alternate route if necessary. Avoid traffic congestion by traveling during non-rush-hour periods. Washington rush hour is generally from 6 to 9 a.m. and 4 to 7 p.m., Monday through Friday. Expect backups during rush hour at the Woodrow Wilson Bridge and the American Legion Bridge. Construction can cause delays at any time of the day. Check state transportation websites before you leave to find out where construction is occurring. The Virginia Department of Transportation opened high-occupancy toll (HOT) lanes, or express lanes, in Northern Virginia in 2012. The project added two lanes to I-495 in each direction from just west of the Springfield interchange to just north of the Dulles Toll Road and included the replacement of more than 50 bridges, overpasses, and major interchanges. Drivers of vehicles with less than three occupants are required to pay a toll to use these express lanes. An E-Z Pass transponder is required to allow for electronic toll collection. Tolls are waived for buses, carpools of at least three people, motorcycles, and emergency vehicles. If you are visiting from out of town and have an E-ZPass from another area, you can use these express lanes. Signs leading up to and within the toll lanes have an E-ZPass logo which tells you that you need an E-ZPass. Fortunately, there are 15 states that use E-ZPass and more than 26 million E-ZPass devices in circulation, so it is convenient for many visitors to use the Express Lanes. If you do not have an E-ZPass device you cannot drive on the express lanes.